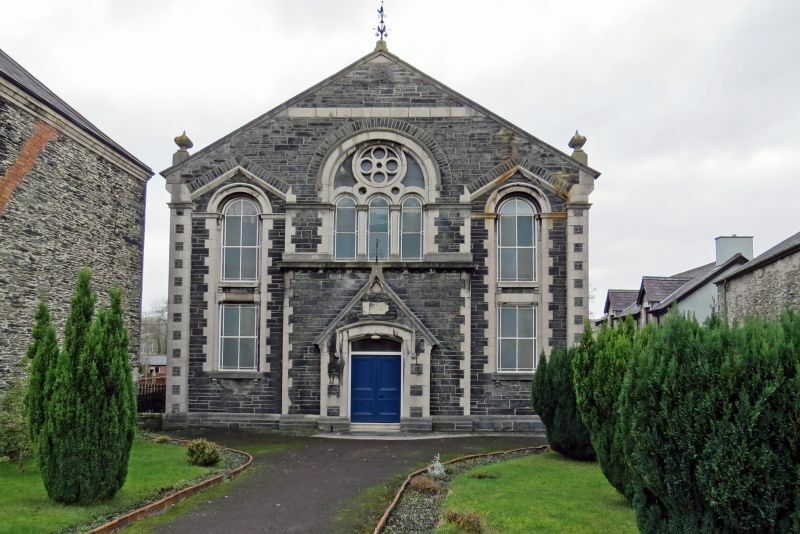 A Calvinistic Methodist Chapel, established in 1800 and rebuilt in 1873. The school rooms to the rear were added in 1901. Roughly coursed and squared stone with freestone dressings and slate roof. Entrance in gable facing street: Shallow segmental archway with stilted hood-mould in shallow gabled porch projection. Full-height round-arched window recesses, set back in pointed arched panels to either side: flat stone lintels to lower windows, round arched heads above with impost bands. Above the entrance, a composite geometric window in round-arched recess with triple round-arched lights with continuous impost band and quatrefoil window above. Decorative quoining to angles, and ball finials to gable coping. 5-window return elevations, 2 storeyed, with round arched upper windows, and shaped stone lintels to lower openings. Windows all sashes with margin lights. School room forms a separate range at right angles to the rear, linked to the chapel by a single storeyed lobby.